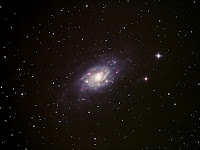 A few nights ago I attempted NGC 2403 in fairly poor conditions so with a much better sky I paid it another visit. This time an improved set of subs produced a noticeably deeper image which I gave a brighter colour balance to try and enhance the Ha regions . Details: 10" f 4.3 Newt. 10x 10 munute exposures @ iso800 with CLS in DSS, CS2, Photobrush & XAT.